man... I'm becomming so pessimistic playing warrior... maybe it's time for me to quit warrior or quit wow period... I can't imaging myself playing something other than warrior in wow. Well its still very early in the damage tuning, so i think blizz set it high on purpose because its easier to tune it down rather then if they didnt buff it high enough and having to shoot higher and possibly breaking it when it hits live. As a matter of cosmic history, it has always been easier to nerf than to buff. Edited by kagan, 08 August 2013 - 11:17 PM. Brace yourselves for the countless priests, mages, r ogues, locks etc that will come here come next patch crying about warrior one shots. "Slam now deals 50% more damage. I guess with the buff realistic slams with cds will be around 150k crits. Sounds like what ret/ enh does live. Did ret/ enh burst get nerfed? Nope. 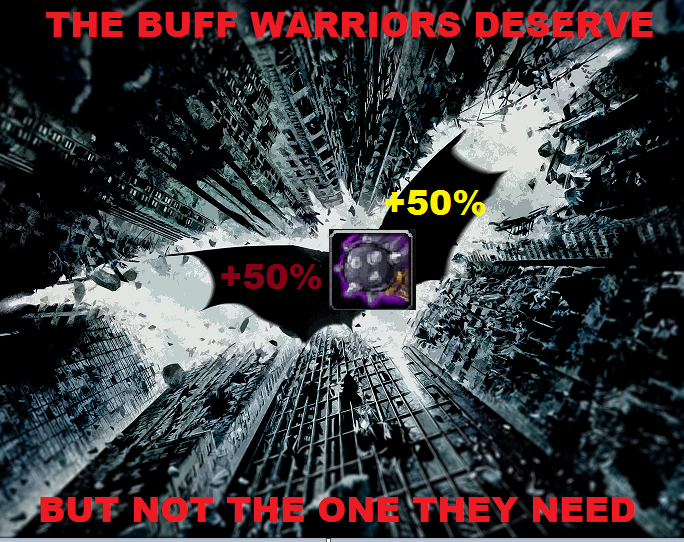 Will warr burst get nerfed? Most likely. Before it even gets life. Cause that is the way of the warrior. I doubt the slam buff will be op. It will add some burst. But that is srs what warriors need. Burst is what kills players not spamming 12k hitting overpowers. And to Irub his post. Managing rage / cs procs for crucial times will make a difference between a bad and good warrior. I even think with this buff, Noob warriors will just keep spamming overpower all day long. Giving overpower procs a 5% chance to proc sudden death will fix the whole warrior pve dps issue i guess. More cs procs. More slam oppertunities, more free of rage attacks (cs itself), More enrage time. It will also give overpower a set in stone role in the arms rotation instead of A does dmg, But B also does dmg, Oh and C does dmg too. For pvp it will still be a defensive stance problem. I'd say give the chance to enrage when being direct hit during defensive stance. And only make it able to proc once in X seconds. With that the 1 rage every 3 sec can be removed. It doesn't make sence anyhow. This still disalows warrs to be offensive with def stance. But if they get focussed they still have enough rage to atleast do something. Edited by Pinka, 09 August 2013 - 12:42 AM. Sad thing about slam is that it only does noticable damage during cooldowns. This 50% might change that. Peace sells ...but who's buying? 150k crits with an ability that only costs 30÷ of their resources and is spammablb? I've critted over 100k on live... this is going to be retarded. funny thing is most of the warriors in this thread are crying its going to be stupid op. I guess with the buff realistic slams with cds will be around 150k crits. I did 160k slams on a mage in molten armor on ptr, obiously without the 50% buff so NO it wont be 150k it will be much more. Edited by Yoloswaggae, 09 August 2013 - 02:55 AM. Its going to be a very noticeable damage increase. This is the wrong direction. PvP-live.com & hydramist.tv - Interviews and articles.